French naval hero Camille Mortenol was born November 29, 1859 in Pointe-à-Pitre, the largest city in the French island colony of Guadeloupe in the Caribbean Sea, the son of former slave André Mortenol, a sailor, and his wife, Julienne Toussaint, a seamstress. A bright child who was particularly adept at mathematics, he attracted the attention of the French abolitionist Victor Schoelcher, who acted as his mentor and obtained a scholarship for him to study at Lycée Montaigne in Bordeaux, France, where Mortenol was granted the bachelor of science degree. 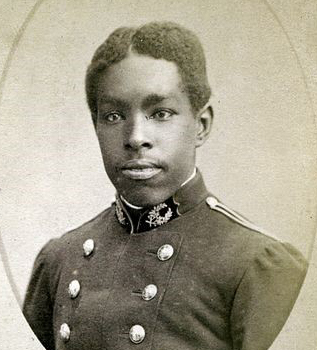 He next became the first student of African descent to attend the École Polytechnique in Paris, finishing in 1880, ranked 19th in a class of 205. Probably due to his father’s influence and connection to the sea, Mortenol chose to pursue a career in the French Navy. As a junior officer, he twice participated in the conquest and “pacification” of Madagascar in the 1890s, demonstrating exceptional competence and bravery that earned him the ribbon Chevalier Legion d’Honneur (Knight of the Legion of Honor) and the appreciation of General Joseph Gallieni. In 1901, he joined the Ogowe expedition in the French Congo (present-day Gabon). Having trained to operate torpedo boats, in 1904 he was promoted to frigate captain and began a five-year tour of duty in the Pacific capped in 1907 with command of the 2nd Flotilla of Torpedo Boats patrolling the waters of southern and eastern China. From 1909 to 1914 he was mostly assigned administrative work at naval offices at the port of Brest. With the onset of World War I, Mortenol was presented with a new opportunity. Recalling his previous experiences with the black captain, General Gallieni, now the military governor of Paris, put him in charge of the air defense of the city, a crucial responsibility requiring the latest technical knowledge. Mortenol called for the use of high-powered searchlights to locate enemy German planes invading the air space over Paris and to destroy them with anti-aircraft fire from the ground, a defensive tactic used to this day. Despite reaching retirement age (58) in 1917, the military retained him and made him Colonel of Reserve Artillery. After serving in the French Navy for more than three decades, Mortenol finally retired in 1919. Mortenol married Marie-Louise Vitalo, a native of French Guiana, in 1902. Though he only returned once to the island of his birth, he occasionally wrote articles published in local newspapers there such as Les Nouvelistes, and he regularly fraternized with Guadeloupeans residing in Paris. Camille Mortenol died on December 22, 1930 and was buried in the cemetery Vaugiard in Paris. In 2014 he was selected one of the four heroes who embodied those who defended the capital during World War I. In addition to at least two ships named in his honor and a statue in Pointe-à-Pitre, in Paris, he also has streets bearing his name both in France and Guadeloupe. “Le commandant Mortenol (1859-1930)” at http://www.une-autre-histoire.org/le-commandant-mortenol-biographie/; “Le commandant Mortenol (1859-1930) - Une autre histoire” at http://www.colsbleus.fr/articles/7962; “Camille Mortenol, un fils d’esclave devenu officier de marine et défenseur de Paris” http://www.opex360.com/2016/11/11/camille-mortenol-fils-desclave-devenu-officier-de-marine-defenseur-de-paris/. “Le commandant Mortenol (1859-1930)” at http://www.une-autre-histoire.org/le-commandant-mortenol-biographie/; “Le commandant Mortenol (1859-1930) – Une autre histoire” at http://www.colsbleus.fr/articles/7962; “Camille Mortenol, un fils d’esclave devenu officier de marine et défenseur de Paris” http://www.opex360.com/2016/11/11/camille-mortenol-fils-desclave-devenu-officier-de-marine-defenseur-de-paris/.